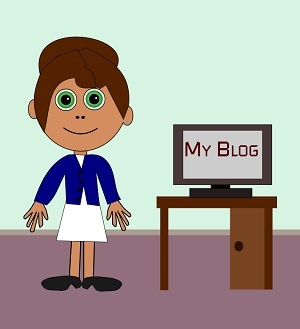 In a previous post I discussed why it’s a good idea for teachers to start a blog. If you’re a teacher, keeping a blog is a great way to join the community of educators already collaborating online, and to share some of your own knowledge with other educators around the world. Starting your own blog is easy – it’s not difficult to set up a Blogger or WordPress site, to pretty it up a little with free downloadable templates, customizable plug-ins, colorful graphics, and new and interesting fonts, and then to start putting out fresh content in the form of blog posts and articles. The hard part is this: once you’ve typed out your first few posts and thrown them up onto the Internet, who is going to start reading them? Below I’ve outlined five methods that I think are good ways to promote your blog and grow it into a community. I should point out that there are plenty of other great posts – and some entire web sites! – dedicated to helping you find followers for your blog. I wanted to share with you those ways that I prefer to share content online; if you disagree with me, I’m all for that, and would love to hear about your own opinions and ideas. The most important part of your blog is its content, and your blog’s content must be interesting and informative. On the Mixminder site we provide free educational content… articles that help educators and parents teach children to acquire important skills, free downloadable worksheets and activities, and a variety of lesson plans. Whatever you do on your blog, you should figure out how to help people do what they want to do – whether that thing is to teach others, form a personal network, learn something new and interesting, or achieve an important goal. Before you publish a new blog post you should ask yourself… how are my readers benefiting by reading this content? There is another side to the strategy of putting out useful, informative content… and that is to not put out content that fails to serve a purpose. There are plenty of bloggers out there who publish a variety of posts that I would not consider useful to the reader. As an example, if someone gives your blog some sort of “Bloggy Award”, and you create a post about how your blog has won that award, is that post really serving a useful purpose by being on your blog? It’s fun to get blog awards and to share the good news, but if all your post is doing is boasting about an award, it is not likely that your readers are going to care very much about it. The content that you share on your blog can be any sort of content, as long as it is purposeful… posts can include written articles, drawings or comics, videos, and audio podcasts. And remember that if you’re interested in growing your blog, it’s important to post frequently… at least a few times each week. If your blog goes stale, or has a history of going stale, you are less likely to gather a devoted readership. When you’re starting your blog, make sure that the blogging software you are using features a way for your readers to leave comments or questions beneath your post. Most blogging software has this functionality built right in, so you don’t have to do any work to give your readers the ability to do this. Then, once your article is posted online for all the world to see, make sure that you check back frequently to see if anyone has left any comments for you to respond to on your post. You can do this through a dashboard interface within your blogging software. When you do receive comments or questions, be sure to respond to them, even if it’s just to thank the writer for taking the time to post a comment on your blog. You want to ensure that the reader knows that you appreciate his or her patronage (as I am sure you do)! And if your readers have any questions for you, answer them as best you can. If your reader has a concern about something you’ve written, that’s okay too – even negative comments on your blog should be “part of the conversation”. Respond to those comments as well, and thank your readers for taking the time to leave them, even if you don’t agree with them! On the other hand, any comments that are spam, or any outright hostile posts, I would simply delete. Those don’t serve any purpose being part of the conversation on your blog. You should also spend some time reading other blogs and commenting on those blogs, to join in on the many interesting conversations taking place online. You’ll be helping to grow the communities on other blogs while giving the readers of those blogs the chance to learn something about yourself and your own interests. Make sure that you leave a link back to your own blog whenever you leave a comment. There are certain comment plugins that allow users to post by using their logins from Facebook or Twitter. These plugins are fine, but whatever you do, make sure that you continue to allow people to post comments in a Name/URL format so that they can leave links back to their own blogs. I don’t tend to comment on blogs that solely allow posting from Facebook or Twitter, because I want to be able to draw readers to my own blog if possible, and not to a social media site such as Facebook or Twitter. One more tip – if you’re going to be posting comments on peoples’ blogs and responding to comments on your own web site, you should consider getting a Gravatar. You will see Gravatars (Globally Recognized Avatars) in the comments section of this page; the tiny pictures to the right of each post are Gravatars that were chosen by the commenters and linked to email addresses to be displayed on blog comments all over the Internet. In my first tip I mentioned that you should make sure that your posts are interesting and informative to your readers. This point takes the first point one step further to indicate that your entire blog should be designed with your readers in mind. Make sure that your site is laid out in a clean and efficient manner, and don’t clutter it up with stuff that doesn’t serve an important purpose. If your blog has too many widgets and gizmos scattered across the page, you will confuse and agitate your readers, which is certainly not your intent. Some friends of mine have recently been seeing success by using a pop-up widget that prompts readers to “like” the Facebook fan pages associated with their blogs. These pop-ups have, for the most part, been bringing my friends more followers – several of them have seen an increase in their Facebook fan base since putting this widget on their sites. But I still refuse to do that here, because I don’t think the readers of this site are coming to this site to satisfy my desire to have more Facebook followers… they’re coming to find educational content for themselves, for their students, or for their schools. Anything that detracts from this key mission doesn’t deserve to be featured on the site. I’ll point out again that this is only my personal opinion on the matter; and who knows, if it turns out to be the case that readers like getting pop-ups on their screens suggesting actions they should take, I might change my mind on allowing such devices on the site in the future. Put yourself in the shoes of your readers, and go with what your heart thinks is right. When it comes to drawing attention to your blog, social networking is where it’s at. Make sure that you feature ways that your readers can find your content online and, if they like it, choose to share it with friends and colleagues. Once you’ve created and uploaded a post, be sure to promote your post simultaneously on a number of different social networking outlets such as Facebook, Twitter, Google+ and Pinterest (and maybe even LinkedIn, depending on the nature of the content you create – LinkedIn is great for business networking and information sharing). You should also provide your users an RSS feed that they can subscribe to through their web browsers or through email updates. If you are a teacher and are thinking of creating a Pinterest account, here are five reasons why I think it is a good idea. Meanwhile, give your readers a chance to promote the great stuff you’ve created by providing buttons for them to click to share your content with their own social networks. On the post you’re reading you’ll see buttons that you can use to share the post on the “social networking usual suspects” both above and below the posts. Make sure that these are easy to find on your own site – once you’ve built up a community around your blog, your readers will play a huge role in promoting your content. Blogging is all about connecting with other people, sharing ideas, debating hot topics, and getting yourself out there. One great way to do this is to write guest posts on other blogs. There are plenty of great blogs out there, many of which already have supportive communities built around them. If you can publish a guest post on one of those blogs, readers of that blog might like what you’ve written and join your own blog’s community or Facebook page. When writing a guest post on a blog, make sure that your post is as of good quality as possible – you want to write something that will leave readers wanting to read more of your work on your own site. You should also do it for free, and make sure that you’re blogging on a good quality blog with a mission in line with your own – there’s no use spending time blogging for someone else if you’re not going to reach the right people with your writing. You may also allow other bloggers to post guest blogs on your own site – just make sure that you can attest to the quality of the articles that they are writing and featuring on your blog. In the end, it’s your blog, and you need to ensure that you maintain control over what people are writing there. Guest bloggers on your site should show respect for your blog and its viewership and offer quality information in their guest posts and not simply thinly-veiled plugs for their own blogs. It takes time to grow a blog’s community, so be prepared to spend some time and effort in growing your blog. By working hard and by staying focused on what’s most important to your readers, you’ll have a good shot at growing your blog’s viewership over time, which is a fun and rewarding experience. Best of luck to you! Do you have any tips of your own to share about growing a blog? I’d love to hear about them – please be sure to comment below (and, of course, be sure to leave a link back to your own blog so that I can check it out). Thank you for the tips! I need to remember that growth is slow. My blog exploded when I first started but now things have settled down and followers are harder to find. Thanks again! Growing a blog’s community does seem to take time… though I find that coming up with posts that garner a lot of attention (through Facebook shares, tweets and likes) seem to bump up your daily page views into the future. So it’s definitely a good idea to come up with interesting and insightful posts that people will want to share with their friends and co-workers. Meanwhile, I will check out the Think, Wonder & Teach blog! All the best to you with your blogging and social networking. Writing reviews and hosting giveaways pertaining to my niche has helped me grow. Also, writing an ebook is another good tool to grow your blog. I haven’t taken that step out. Hello Jill, you bring up some really great tips! I haven’t written an eBook either, but it does make a lot of sense that having a well thought-out work of writing to share could help you to make a name for yourself in whatever domain you’re writing in. Meanwhile, writing reviews sounds like a great tip – do you write reviews on other blogs, or on products that you’ve been using in the classroom? I have also noticed that a lot of teachers do host giveaways of worksheets and curriculum online. On the Mixminder site we’ve gotten in the habit of giving away free worksheets and activities, but we haven’t yet branched out to start collaborating with other teachers in some of the mass giveaways that seem to have brought a lot of interest to the blogging community of teachers. It does seem to be something well worth doing. Thanks very much for your additional tips, and all the best to you and your blog. Brian, I found your blog thru Pinterest and am really glad I did. My blog is just a few months old and I get discouraged at times by the slow growth of followers. Since setting up a Pinterest account, I have seen steady growth. So, you are absolutely right about social media. I’m not sure how to add the Pinterest, etc. buttons that you describe in #4. Is there a tutorial somewhere to which you can send me? Hello Barb, I too am very glad you found this blog! Thanks for asking about how to add social media buttons to your site – that is a very good question. The buttons that I use on my individual posts come from a ShareThis plugin, which I then installed onto Mixminder which is a WordPress site. I checked out your blog and it appears that you are using the Blogger platform by Google, who operates Blogspot, which is somewhat different from WordPress. The good news is that ShareThis allows you to download a snippet of code to add onto your site to add the social media sharing buttons for Blogger as well. Here’s the ShareThis site, with information about how to get the various social media buttons – once you’ve done that you can play around a bit to set it up how you’d like. Good luck and let me know how it goes! I’m with you on the “like” pop-ups. Can’t stand them! I agree about guest blogging. I think linky parties and other forms of collaboration have also helped boost my community. Thanks for the insight Christi. I haven’t had much experience with “linky parties” myself… Yvonne has participated in some of those, and they do seem to generate a lot of cross-blog traffic, which is great. All the best to you and your blog – I’m looking forward to reading more of your posts! Thank you for posting this information. I am new to the blogging world. I will take your advice and try to enhance my posts and page. I also want to look at the ShareThis site and spruce up my page a bit. Please check out my site. Any feedback is greatly appreciated. Thanks for your feedback on the post – I appreciate it! I’m glad to hear that you’ve started blogging; I hope that you will find it fun and rewarding. I checked out your blog and it looks great so far – I’m looking forward to reading more articles from you in the future. Please let me know how else I can help with the blogging advice; I’d be glad to do so. Brian, I follow several teaching blogs (I am a kindergarten teacher) and have wanted for some time to start my own. However, I am not very technology savvy and have no idea where/how to begin. Are there sites that offer tutorials on this type of thing? Thanks. Corrie, I don’t want to step on any toes, but I always encourage teachers to jump right in because that’s one of the most common questions I get. I always tell teachers if they can email, they can blog. I just shot a couple quick videos yesterday showing you how to set up a blog and how to personalize it a little. You can do it! Hello Christi – don’t worry, you are not stepping on any toes! I appreciate your jumping in to give advice; I’m always glad to learn and benefit from the knowledge of others. Thanks very much for sharing your videos… I completely agree with you that the best way to start a blog is to jump right in and start blogging. Please let me know if you create any further resources for bloggers or for teachers who are interested in starting a blog – I’d be glad to watch them. Oh, good! I was having the link/no link debate. Blogging sounds so much harder than it really is. I plan to follow-up with a video on adding links, pictures, etc. next. The more teachers we get blogging, the more ideas there are to share. Agreed! Good luck on the follow-up videos… I am sure there are many teachers out there who would love to get involved, but who do not feel that they are “technical enough”… I’m sure they’d appreciate your guidance. I agree with Christi that, when it comes to writing a blog, the best way to learn is to learn by doing. Both Blogger and WordPress offer free blogs, and starting them is as easy as following the directions on the screen. For example, if you have a Google account, you can start a blog on Blogger (which is owned and operated by Google). If you log into Google (or Gmail) and visit the Blogger homepage, in the middle of the page there will be a big blue button reading CREATE YOUR BLOG. Click on that and follow the instructions… you’ll be writing blog posts in no time. Start simple and post a few words; as you grow your blog you can learn how to write more complicated articles including links, photos and videos. Best of luck to you! Anytime, Corrie… I’m glad we were able to help in some way. Please do let me know when you start your own site, I’d be glad to check it out. Best of luck with the blog creation, and also with the selection of a site name… it can definitely be hard to come up with the perfect name for your blog. Hi Lee Ann, thanks for asking! 3. Choose a title and a Blogspot address for your blog as indicated. The address will have to be unique… so for example, you might choose “teachingblogname.blogspot.com”. 7. Click ‘Save’ to save works in process; when you’re ready to publish the page to the Internet at large, click ‘Publish’ – and you’re done! I hope that this is helpful! You don’t need to be a technology whiz to start blogging. You mentioned images… in order to insert an image into your page, just click on the little icon that looks like a painting in the Blogger toolbar. You can also insert a video onto your post; there is an image for that one right next to the image for inserting a graphic. Best of luck to you! Let me know if you have any further questions, I’d be glad to help. Hi Diane, thanks for your comments! I appreciate your very good advice for bloggers. I agree that giveaways, linky parties and freebies are great ways to promote your blog. It seems that really connecting with people, their interests, and of course their blogs makes for powerful commumities of people sharing tips, information and material. Keeping current with the latest holidays and seasons is also a plus – I posted a lot of Thanksgiving-themed Common Core math activities over the weeks leading up to the Thanksgiving holiday in the United States, and that helped to generate a good number of search results for Thanksgiving worksheets and activities on Google. I’m about to start doing the same thing for the Christmas holidays and the winter season. Thanks again for your comments, and all the best with your blog! I’ll be sure to check it out. Great advice – glad I found this post! As a new blogger, I could use all the help I can get! I’ll also have to check out your article about pintrest – I’ve heard of it before, but never really used it, so I’m curious to see what you have to say. Thanks again! Thanks so much for your comment Ashley – I appreciate it! Best of luck with your German teaching blog… I checked it out, and it looks great so far.